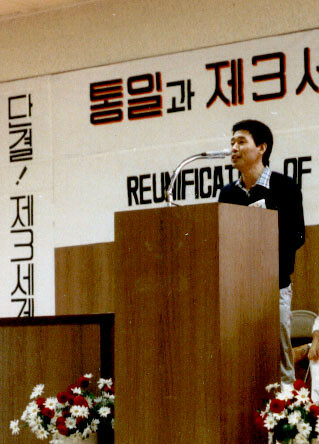 I first met my "sunbaenim," (senior brother) Yoon Han Bong in May of 1983, when I was a foreign graduate student in New York. I met him with a group of students concerned about the path of our homeland. We were urban and full of intellectual pretentiousness; we thought we would meet a guy in a suit, with a refined speech. When he walked in, he did not look like what we expected at all... he resembled a handyman idling around Seoul's Union Station, with rugged hands. I thought: "this can't be him, right? Is someone else coming behind him?" and looked for others. Sometimes I remember that first encounter as if it happened yesterday. Yoon sunbaenim revolutionized our lives upside down. I remember people saying, "He's the living Jesus!" or "This is our Lenin in Korea!" 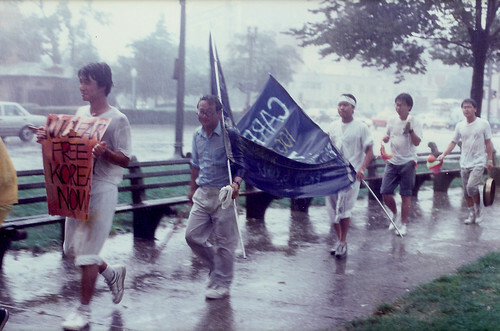 During the next year, we organized local chapters of Young Koreans United in New York, New England, and Philadelphia, and went on organizing. Giving up everything, like a wild horse we worked relentlessly for 10 years with Yoon sunbaenim at our side. Since then, the children of the founding members of YKU are going to college and Yoon sunbaenim has left this world. We still reminisce about him and often ask ourselves: "What would Yoon sunbaenim do?" but we now have to work on our own. 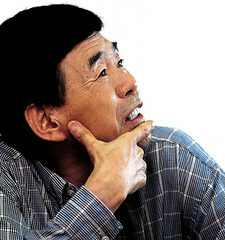 In thinking of Yoon sunbaenim, we reflect on the teachings he left behind, and our own life. Have we become overwhelmed by everyday life and lost all vision for the future? Are we not distancing ourselves from his teachings, which emphasized dreams and hopes based on long-term planning and a wide perception of the world? Have we been speaking ephemeral words that lead us astray from the real world and the community around us? Have we been unable to keep in constant communication with the people and seek the right path ahead? Have we cast a blind eye to the challenges ahead, trapped in the old ways? Have we settled for rigid doctrines, and forgotten to lay our roots in a rapidly changing world? How much are we really doing so that our next generation can realize their dreams and carry on the torch for the movement? 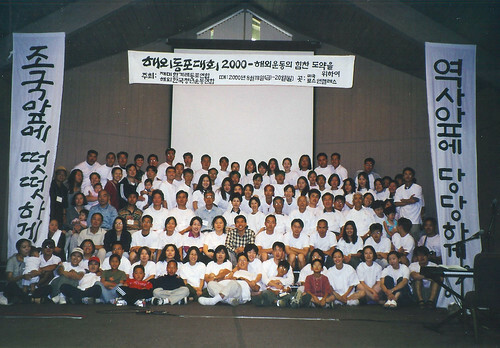 Have we fully embraced and reached out beyond cultural barriers to 1.5 and second generation Korean Americans? As we seek to find a clear answer to these questions, we approach the first anniversary of your passing. Yoon sunbaenim, leave the work behind to those of us who are left behind. May you rest in peace. We do not participate in the movement for Korea's democracy and reunification merely out of patriotic longing or a burst of nationalism. We are immigrants in the United States, the epicenter of capitalism, seeking to lay our roots here for generations to come. 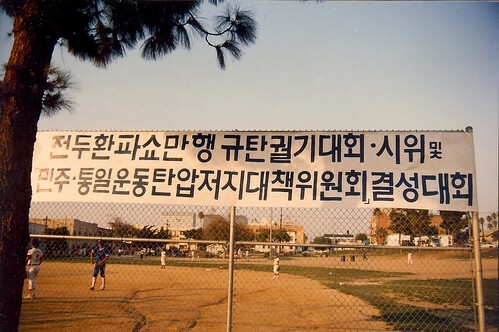 A society built on individualistic values may lead us to into forgetting about our own identity as Korean Americans, dismiss our neighbors and society in general - even our parents and siblings. We may be drawn to worry solely for our own well being and personal success. To do so will weaken our human spirit and prevent us from laying our roots in this land and passing on a prosperous future for our children. By confirming our responsibility and fortifying our links of solidarity towards our neighbors, both the U.S. and Korea can overcome these temptations. By doing so, we strengthen our identity, and bring ourselves to walk the right path. This is the spirit we must pass on to future generations, so that we may live in harmony within a diverse, multi-ethnic society. This is the reason we engage in the movement for Korea's democracy and reunification; it is a constant struggle to emerge as the best of ourselves. The Gwangju People's Uprising was the spark that transformed the movement for Korea's democracy and reunification expanding it from its former focus on an individual's consciousness to a mass-based, organizational movement. 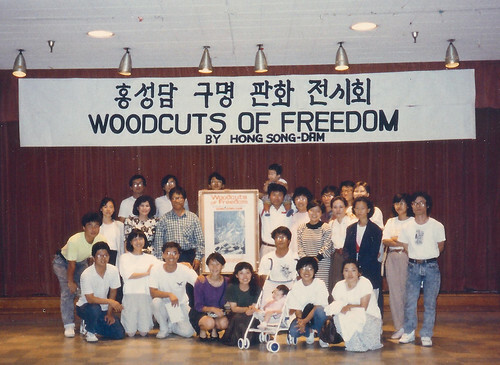 The movement in the U.S. was able to grow because of Yoon Han Bong, one of its grassroots leaders who had received political asylum in the U.S.
First, we established our own identity through continual learning of Korea's history, culture, ideology, and political economy. The International Congress for Peaceful and Self-Determined Reunification which presented a way of re-thinking a divided Korea as a united Korea and opened the road for peaceful dialogue and collaboration outside the frame of the Cold War, was among our greatest achievements. Second, we captured the energy and attention of young people, while incorporating workers and small business owners, as the leaders of the movement --- moving away from previous elitist forms that relied on ideologues and academics. Third, we brought the movement into everyday life. Funding was procured by fasting one day a week or recycling cans. Campaigns were broadly deployed through postcards or telegrams, which were easy to execute in daily life. These seemingly small efforts were part of the larger movement. 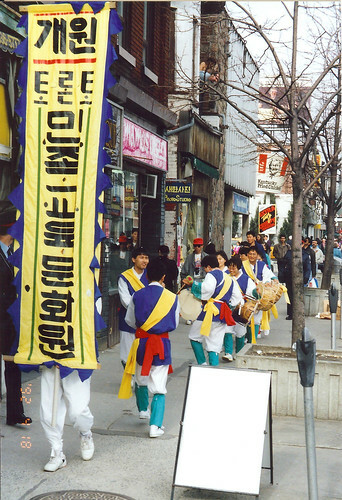 We also used poongmul, a traditional community cultural tradition, in political actions to catch the public's attention. Fourth, we sought to actively reach out to mainstream society and strengthen solidarity ties with broad political & social sectors. Our experience in carrying out political and cultural outreach activities in D.C. and the founding of community centers in major urban cities demonstrate how a mass movement can connect with non-profit community based organizations. Sixth, we raised awareness of the fact that a progressive movement involved a measure of self-sacrifice and self reflection. We have held an egalitarian structure in which no member - be it a leader, an organizer, a regular member or a financial supporter - has sought or gained fame or influence by belonging to our organization. Sincere dedication is the biggest drive in changing our society. I hope that our organizing work to date becomes strengthened, rooting our political power on this land, and allowing future generations to proudly recognize their heritage and engage in American society and the progressive movement. 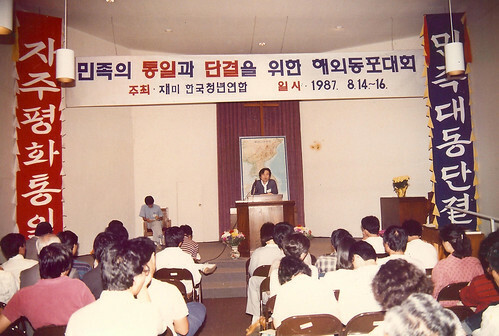 I believe this to be the mission entrusted to us 28 years ago by the Gwangju People's Uprising and the late Yoon Han Bong. [[Yoon Han Bong]], a leading activist involved in the [[5.18 Uprising]] fled political persecution by stowing away on a cargo ship for 35 days. He arrived in Seattle in 1981 and received political asylee status. 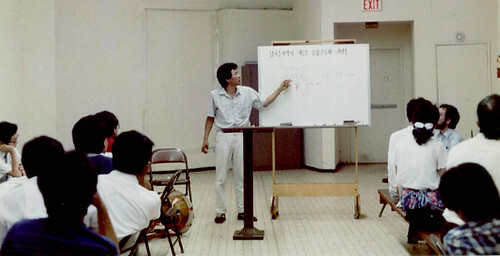 In 1983, he founded the [[Korean Resource Center]]. 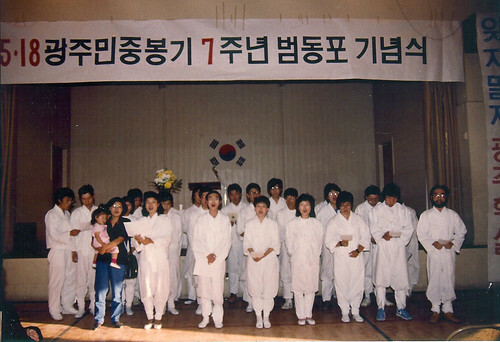 One year later, [[Young Koreans United]] of Los Angeles was formed, eventually forming chapters nationwide and later in Canada, Australia and Europe. 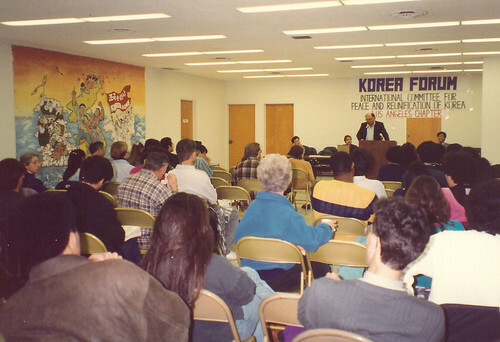 Organizing capacity locally and internationally was strengthened with the international expansion as well as the formation of the [[Korean Alliance for Peace and Justice]]. 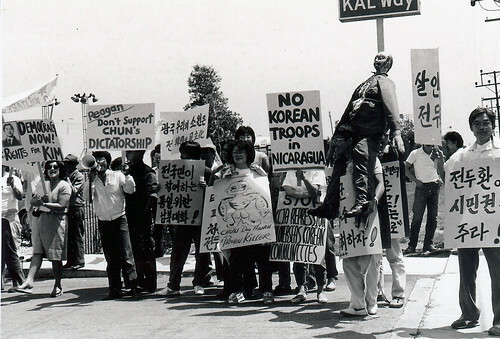 Since then and until his death, Yoon educated young Korean Americans on the development of a organized movement for democracy, reunification and peace. 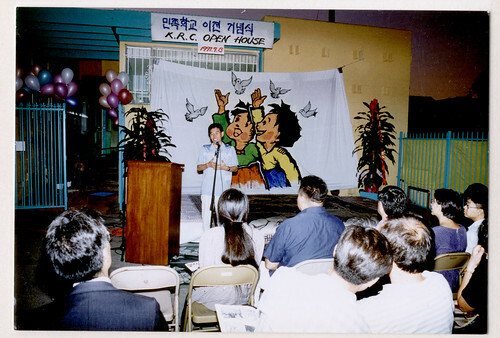 Young Koreans United and the Korean Alliance for Peace and Justice viewed Korea as one nation, not two separate nations, and promoted the belief in a movement that is determined by the people. 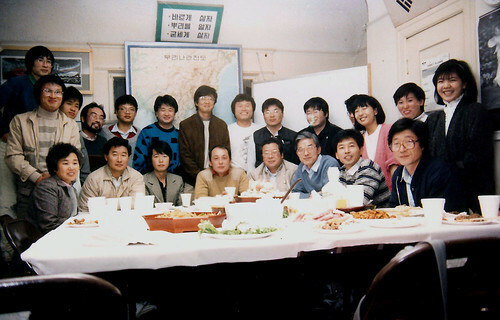 Young Koreans United's capacity and strength in organizing is based on its ability to analyze the current political situation, lay local roots, and facilitate member incorporation of political views into one's way of life. 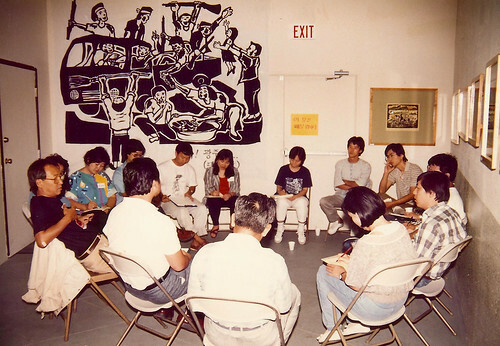 Since its founding conference in San Francisco on August, 1985, Young Koreans United recruited members intensively and coordinated regular study sesions and conferences to educate members on developing a common political consciousnes and plan activities for longterm change. 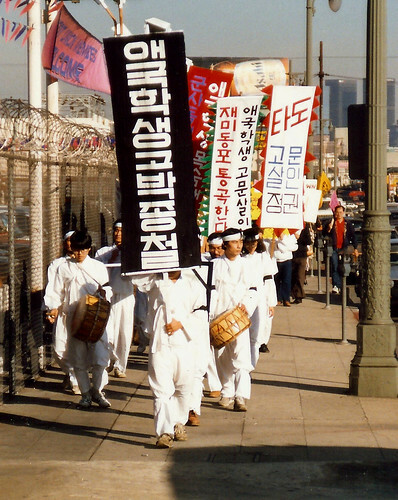 Young Koreans United has significantly supported the movement for democracy and against the militarization of Korea; revitalized after the 5.18 Uprising in 1980. 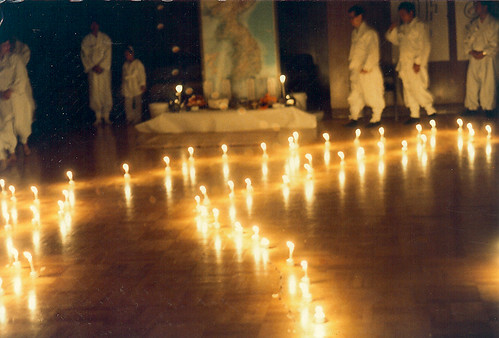 As independent organizations, Young Koreans United and the Korean Alliance for Peace and Justice advocates to the American government for a democractic Korea and extends solidarity to activists in Korea and diverse progressive organizations in the U.S.
From April in 1988 to June 1989, for 14 months, Young Koreans United and the Korean Alliance for Peace and Justice worked with the organizations within the Korea Support Network to gather more than 100,000 signatures for the withdrawal of nuclear weapons in the Korean peninsula. 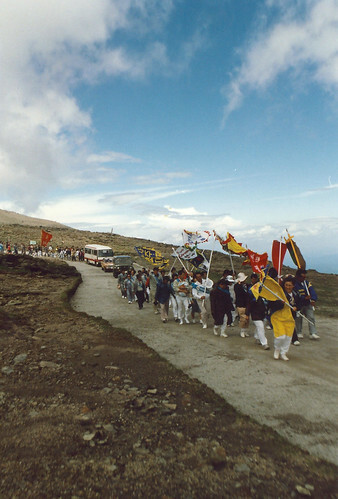 The signature drive enabled YKU and KAPJ members to talk to more than 300,000 people on the need for a nuclear-free Korea. These signatures were carried as a part of the U.S. Peace March that began at the U.N. headquarters in New York to Washington, D.C. In 7 days, YKU members marched more than 150 miles. 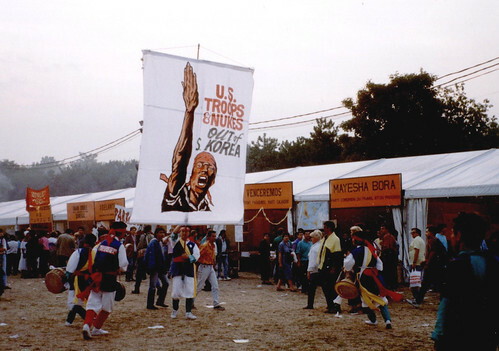 In August 1989, working in collaboration with international peace activists, YKU organized the "International Peace march for Peace and Self-Determined Unification of the Korean Peninsula." The delegation which included 120 members of YKU, 30 international allies, South Korean student activist Lim Soo Kyung, and Reverend Moon Hyun Shin, drew the world's attention. 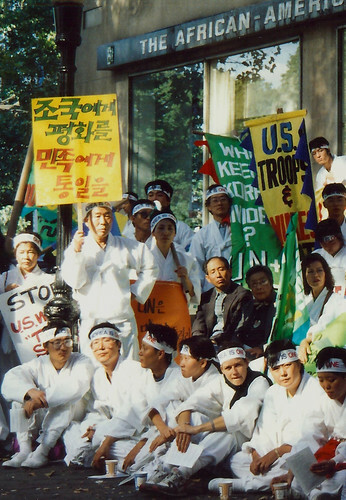 YKU members also held hunger strikes for 15 and 22 days to urge the U.N. to conclude a peace treaty and oppose the separate membership of North and South Korea into the U.N. The 22-day hunger strike in October, 1989 was the longest one ever held in front of the U.N. since the U.N.'s establishment. The National Security Law was enacted during the Japanese annexation period and continued during successive military dictatorships which criminalized and killed many democracy activists. The U.N. Human Rights Committee had recommended an end to this law. Yet, this law remains in effect as a tool to suppress political opposition. 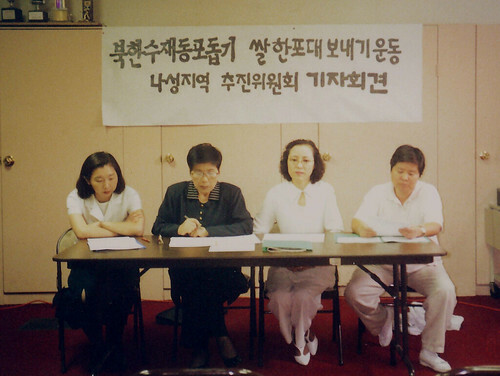 Young Koreans United and the Korean Alliance for Peace and Justice has led campaigns to revise the Status of Forces Agreement, abolish the National Security Law and equalize the relations between South Korea and the U.S. The foundation to organizing is education. To increase full and deep participation, we need to educate our community through the production of educational materials and events. 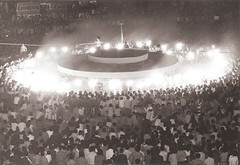 Other activities include people's theatre, cultural performances and issue education through poongmul performances. We have mobilized our cultural troupes to effectively promote our issues to diverse communities. Koreans have suffered greatly not only from the Korean War but also from the separation between North and South Korea. 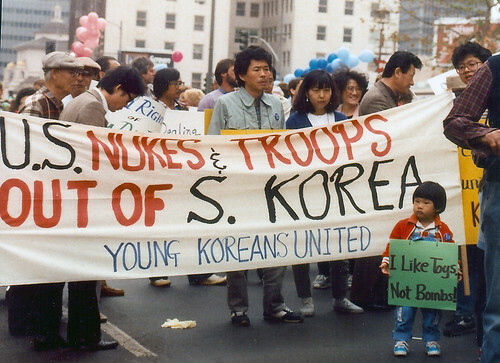 Young Koreans United and the Korean Alliance for Peace and Justice has opposed wars and militarism as a part of realizing peaceful coexistence in the Asia Pacific region. 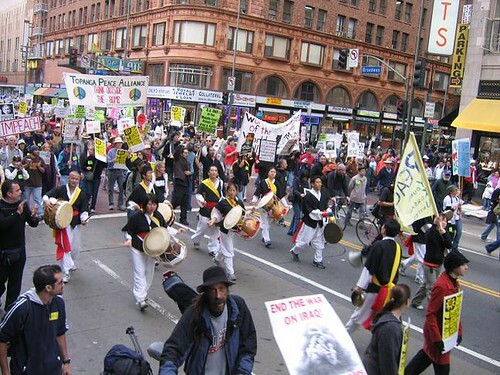 Since the events of 9.11, Young Koreans United and the Korean Alliance for Peace and Justice has criticized the pre-emptive strike policy of the Bush administration which has resulted in what we see now in Afghanistan and Iraq. 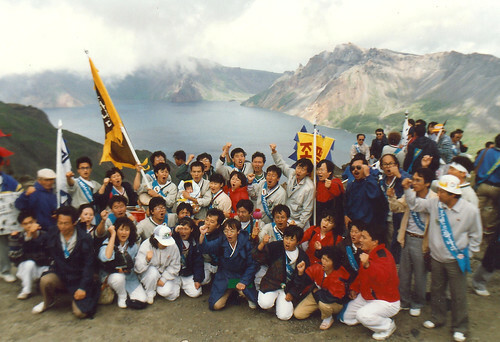 In 1996, Young Koreans United and the Korean Alliance for Peace and Justice in cooperation with the World Food Programme of the United Nations carried out two successful campaigns (North Korea Food Aid and Feed the Hungry Children) for flood victims in North Korea. 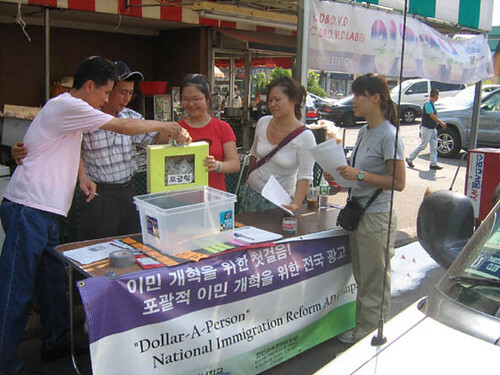 Through a 4-year intensive street fundraising drive, Young Koreans United and the Korean Alliance for Peace and Justice raised $300,000 of rice and nutrition bars for the people of North Korea. 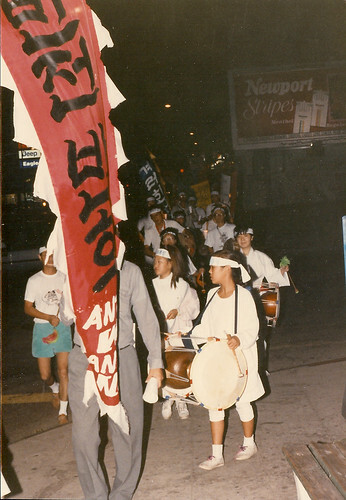 The Los Angeles Civic Unrest in 1992 opened the eyes of Korean Americans to the economic disparities and racism in American society as well as the need to participate politically. 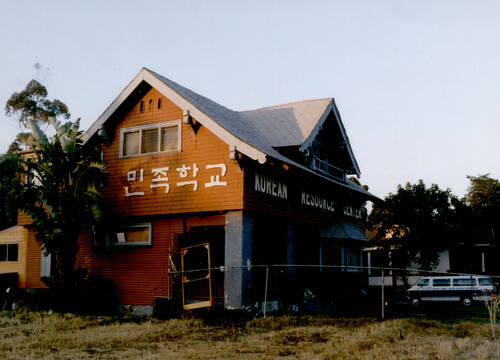 Two years later, the rise in anti-immigrant sentiments and legislation spurred the formation of critical national and local community based organizations to project a unified and progressive Korean American voice. 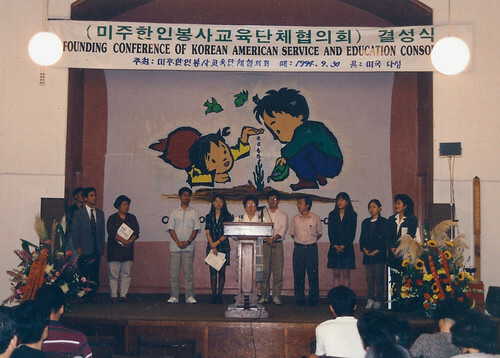 In 1994, under the leadership of Young Koreans United and the Korean Alliance for Peace and Justice, the [[Korean Resource Center]] in Los Angeles, [[Korean American Resource & Culture Center in Chicago]], and YKASEC - Empowering the Korean American Community in New York formed the [[National Korean American Service Education Consortium]] (NAKASEC). 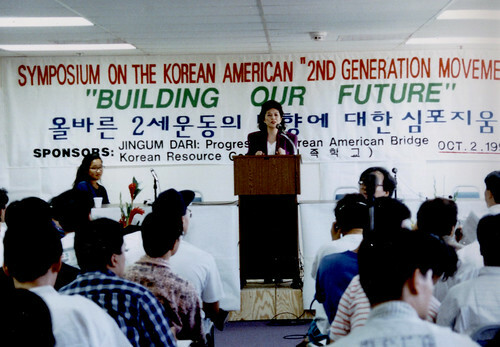 Since then, NAKASEC has worked to educate, advocate and organize Korean Americans on major immigrant rights and civil rights issues. 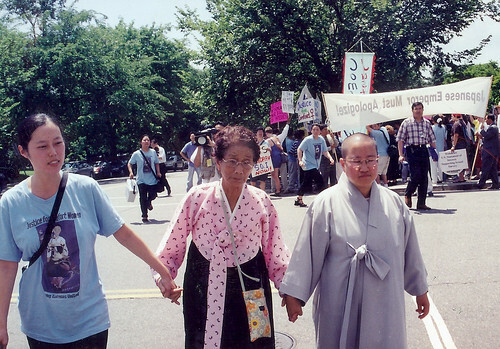 Young Koreans United's grassroots spirit and vision for a just America through community organizing. 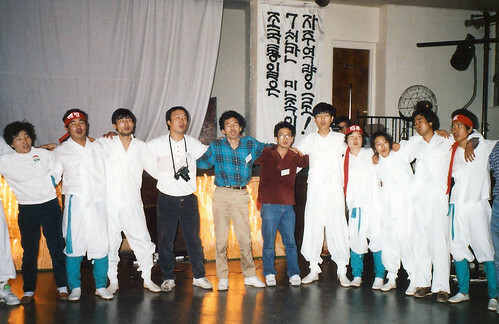 The vibrant 5.18 spirit combined with the tenets that the late Han Bong Yoon taught us - "Continuous political analysis" and "Make the movement a part of your life" - will remain to live on in the hearts of the Korean diaspora.